Lowdown: In the thick of WW2, a group of men become soldiers in order to set out to save the best of Europe’s art. The duo of George Clooney and Grant Heslov has been known to make films delivering strong social messages (e.g., Good Night, And Good Luck or The Ides of March). The same goes for The Monuments Men, a movie that is made in order to demonstrate just how important art is to human civilisation. However, watching the movie makes it very clear its primary purpose is to act as a commemoration for the efforts of a few men to save Europe’s art from the hands of Nazi Germany (and then also the hands of Stalin’s USSR). We follow the allegedly true exploits of a group of ordinary men who happen to be affiliated with art, either through their position at a museum, choreography or just plain admiration. 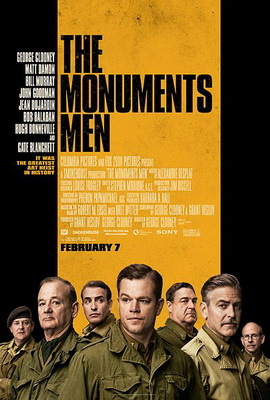 They are led by American George Stout (Clooney), and they are at the core of the ensemble cast offered by Monuments Men: Matt Damon, Bill Murray, John Goodman and Hugh Bonneville (the Earl of Downtone Abbey). There is also some little help received from Cate Blanchett. Essentially, Stout figures out Nazi Germany has been doing its best to put its hands on Europe’s most precious art on its warring way, and it is therefore imperative for the Allies to rescue that art from ending up at Hitler’s dream Nazi museum or in private Nazi hands. The catch is, there is still a war going on, and men are still dying fighting it left and right. It is up to our men to convince the powers that be their mission is essential; then it is up to them to don army uniform and head to their own version of battle. Along the way they will hit real battles and pay the ultimate price. There can be no doubting the historical importance of the real Monuments Men. Just think about their noble sacrifice and compare it with ISIS destroying thousand years old relics of human civilisation in its insane quest. Also notable along the way is the big human tragedy that was World War 2: a lot of the art our men fight for was stolen from Jews. Most memorable is the crew’s encounter with sacks filled to the brim with golden teeth extracted from what used to be people. As important as it is, the question is whether The Monuments Men is a good movie. Here I can state my unequivocal opinion that it is not. Sure, it is a nice collection of war time adventure stories that are pretty entertaining. Sure, this is a movie that left me with a grin and proved nice, easy entertainment. But a good movie it is not; there is a lack of cohesiveness when it comes to generating a proper unified story out of the men’s different escapades. There is also artificial tension when it comes to the way the movie deals with the Soviet threat. Even on the art front, the two pieces of art at the centre of the movie happen to be pieces I have never heard of before. Yes, I know this says more about me than about the movie or the art, but I suspect the same can be said about the bulk of the folk getting to watch this film. Overall: I enjoyed watching The Monuments Men even if I cannot endorse it as much as I have previous Clooney/Heslov productions. 3 out of 5 amused crabs.